Antarctic cruises set sail from Patagonia's southernmost towns, so for Patagonia visitors who have the time and budget, a voyage to the Great White Continent is not to be missed. Antarctica is one of the last truly wild places on earth and sailing through its ice-packed waters is a once in a lifetime experience. There are many ways that you can explore Antarctica from Patagonia. The length of time you would like to spend away usually dictates how far south you can go and how long you can spend at each place of interest. Most trips will involve voyaging on a cruise ship. You can also fly to Antarctica. If you're visiting Ushuaia and are looking for a short visit to Antarctica, take a look at our express trips. If you have the time and budget, look into an extended Antarctic cruise with Swoop Antarctica. Here at Swoop, we're committed to listening to your different goals and desires and finding the right Antarctic trip for you. Antarctica and Torres del Paine National Park - Sail all the way to King George Island before catching a flight back to Patagonia to enjoy trekking, kayaking or mountain biking. 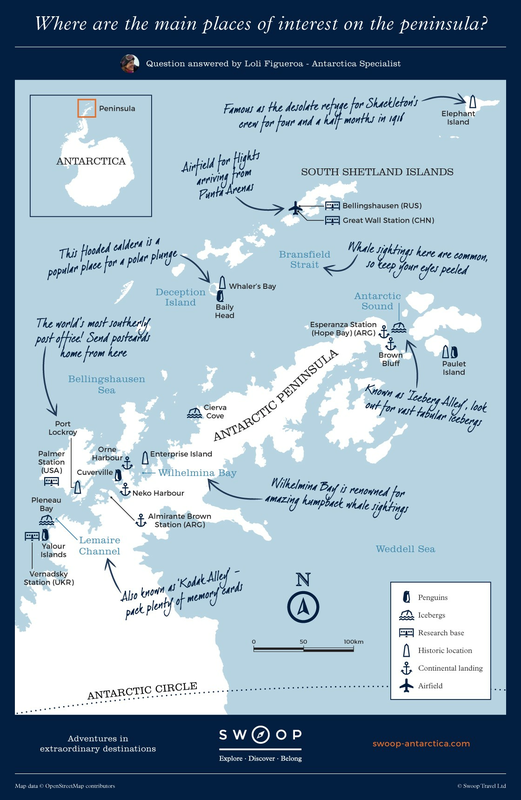 Antartica and Navarino Island - Fly to King George Island and spend the day exploring Antarctica. Then during the rest of the trip stay at a remote lodge and discover Navarino Island, the Beagle Channel and Cape Horn. Express Cruise Only- If you just want to visit Antarctica and you're on a time constraint then this is the trip for you. Sail there and fly back. Private flight - A two-day flight to Antarctica if you really are short of time. The classic way to see Antarctica is on an 11-12 day voyage from Ushuaia to the Antarctic Peninsula. You will have plenty of time to explore the channels and icebergs as well as boarding small Zodiac boats to visit penguin colonies. It is possible to journey further south towards the Polar Circle, particularly in the height of summer when the ice has melted sufficiently. Few people have the opportunity to venture this far. A truly remarkable voyage of up to 21 days takes in South Georgia and the Falkland Islands which offers even more diverse wildlife and unique landscapes. Our sister company, Swoop Antarctica, specialise in providing a variety of Antarctic adventures. Working directly with all of the Antarctic expedition operations, they can help you narrow down your options and decide where and when to visit to see specific wildlife and parts of the region. They can also share their impartial advice on planning the details from cabin types, to additional activities, to preparing the right kit and travel documentation. An experienced team of polar enthusiasts based around the world, they understand the significance of a trip to the continent and are passionate about connecting travellers with the very best option for them. We appreciate that cruises in Antarctica are expensive and for many, they are a once-in-a-lifetime experience. If your budget can't quite stretch as far as Antarctica, we offer some similar and perhaps more affordable experiences in Patagonia. Here you can join a number of different adventure cruises which sail along its dramatic coastline, through its fjords and up to its glaciers.